In 1974 the young Timm Rautert travelled to Pennsylvania to photograph those who normally don't allow themselves to be photographed: the Amish, a group of Anabaptist Protestant communities. Four years later Rautert returned to America, this time to the Hutterites who live so stringently by the Ten Commandments and the bible's restrictions on images that they have their identity cards issued without photographs. Both these two series were influential on Rautert's later work and No Photographing brings them together for the first time. 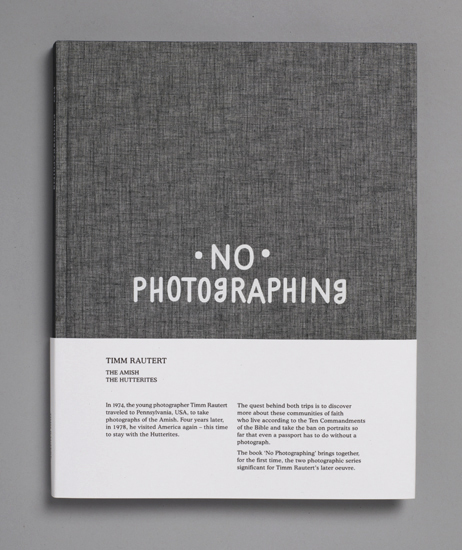 The book-design interlocks the the two photographic series in irregular turns, interrupted by sequences of entirely blank pages that hint at the obstacles and impossibilties to get close to the subject matter.